Regarded as the most sacred shrine in Japan, Ise Grand Shrine welcomes over 7 million people every year. There are two main shrines at the Ise Grand Shrine: the Inner Shrine and the Outer Shrine. It is said that the Shrine was built over 2000 years ago, and it is rebuilt every 20 years according to Shinto traditions. Besides paying respect to the deities, visitors can also head to the riverside purification site and purify their minds with the sacred water of the Isuzugawa River. Just opened in April 2017, Legoland Japan is a must-go attraction for both children and adults! Made up of seven different themed areas, visitors can enjoy a great variety of attractions with their loved ones. Among the most popular themed areas, Miniland has replicas of cities across Japan that required more than 10 million pieces of LEGO to build! Besides this, there are Splash Pad, S.Q.U.I.D. Surfer, Brick Party, Observation Tower and many more attractions that are so fun that you don’t want to leave. Situated three hours (by bus) away from Nagoya CIty, Shirakawa-go & Gokayama are a UNESCO World Heritage Site that has been home to the locals for more than 250 years. These homes are wooden farmhouses constructed in the characteristic gassho-zukuri (“hands in prayer”) way that can endure heavy snow during winter season, and it is a spectacular sight that is worth visiting and seeing. You may also spend a night at one of these farmhouses and experience the lives of the locals. Known as one of Japan’s three best hot springs, Gero Onsen is a popular getaway destination for Japanese people. 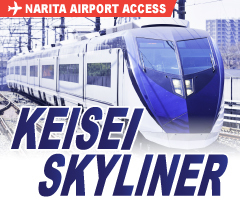 Just 2.5 hours (by JR train) away from Nagoya City, you can find plenty of hot springs and traditional Japanese inns to spend a couple of nights at. Besides onsen, you can also visit the Gassho Village to check out the famous gassho-zukuri farmhouses, local folk art and more. If you would like to learn about Japan during the Meiji Period (1868-1912), you must pay a visit to Meiji Village. This open air museum contains western-styled buildings that were built a century ago, and it is a surviving evidence of the prosperity that once existed during the Meiji Period. 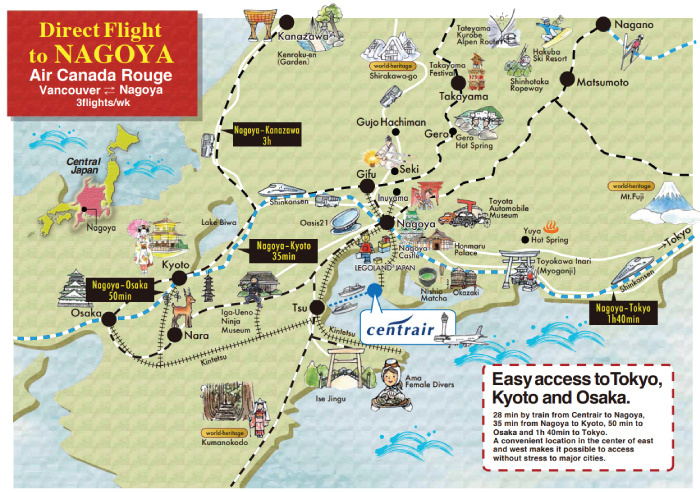 Located an hour away from Nagoya City, you may take the train (30 mins.) 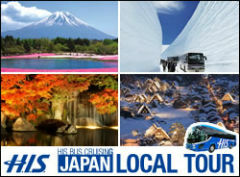 and transfer to Meiji Mura by bus (20 mins.). The city of Inuyama (literally “dog mountain”) is only 35 minutes (by JR train) away from Nagoya City, and it is home to Japan’s oldest wooden castle, Inuyama Castle. 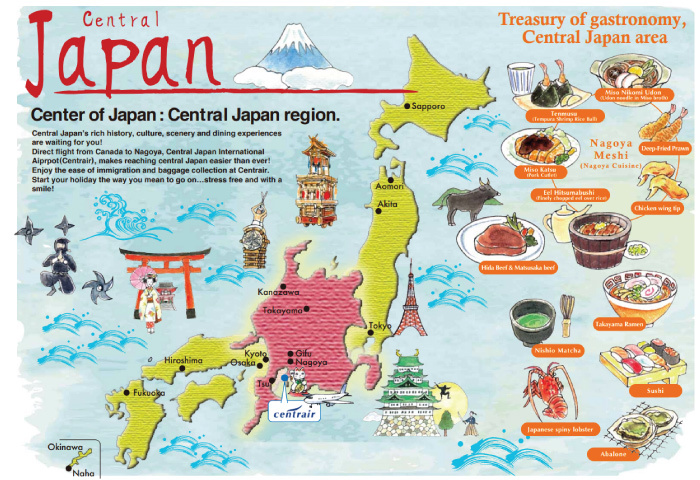 When you are there, you should also check out the Castle Town that surrounds the castle, as it is full of authentic Japanese stores and restaurants that will certainly make an impression on you. Nagoya Omotenashi Bushotai is comprised of 6 bushos (army generals) and 4 jingasa soldiers. 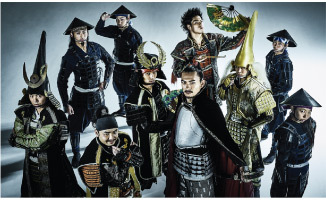 The 6 bushos are; Nobunaga Oda, Hideyoshi Toyotomi, Ieyasu Tokugawa, Toshiie Maeda, Kiyomasa Kato, and Keiji Maeda. Youtube video on Nagoya Omotenashi Busho-tai performance at Vancouver Art Gallery on June 28th 2018.